Synchronizing Outlook between computers now made easy with Sync2, powerful Microsoft Outlook synchronization add-in software. Sync Outlook personal and public folders. Sync Outlook calendar, contacts, email, tasks, notes and Outlook journal between multiple computers without Microsoft Exchange server. Sync Outlook with Google, Gmail contacts and tasks, sync Google calendar with Outlook. Clone and synchronize Outlook .pst data file using shared folder on LAN, USB drive or FTP. Synchronize Outlook 2016, 2013, 2010, 2007, 2003, 2002 automatically. You can schedule automatic Outlook synchronization or perform a manual sync on demand. Synchronization will be performed in background, even if Outlook is not running. Share Outlook Calendar with Google Calendar. Sync Google Contacts, Tasks with Outlook Contacts and Tasks. Sync address book and Gmail contacts. Synchronization of multiple Calendar folders, Google Calendars and Gmail Contacts accounts are supported. Event-based Outlook sync, only changes are synchronized. 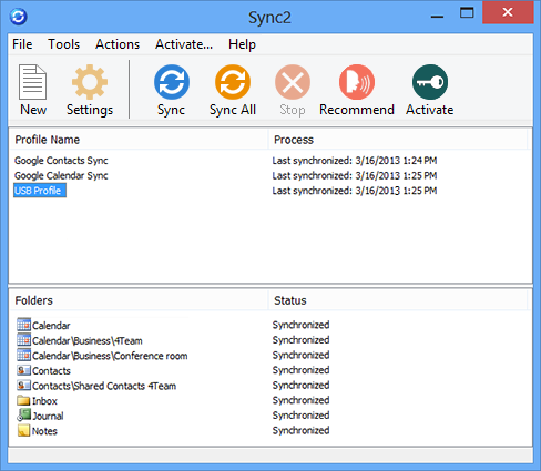 Sync2 interface is similar to Microsoft Activesync interface. No need to transfer large PST files. Microsoft Exchange Public folders are supported. Synchronize specific Outlook folders with different workgroups. Sync all item fields, including read/unread statuses. Filter items by date for synchronization. Use your PC, any networked device, FTP folder or removable memory device (Memory cards, USB drive or HDD) as shared folder location. Backup data before synchronization using Folder Backup. Compatible with latest Windows 10 and Outlook 2016. Free one year support and upgrades. Use free 4Team FTP file sharing service. No server and no IT specialist is needed to install and use Sync2 software. 4Team Corporation offers cost effective Outlook solutions for personal, business and family use.